Jason Knight was on target for Ireland. 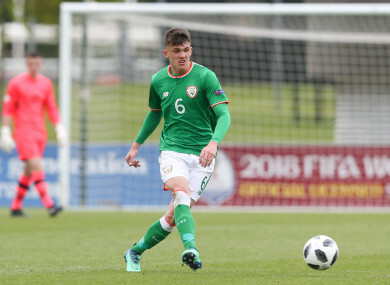 THE REPUBLIC OF Ireland have taken another huge step towards qualification for the U19 European Championship after recording an impressive 3-1 win over Azerbaijan. Goals from Tyreik Wright, Jason Knight and Jonathan Afolabi secured the victory for Tom Mohan’s side on Saturday in the Russian city of Krasnodar. The result means that Ireland are currently in pole position in Group 1 and if Russia fail to beat Romania in the other group game later this afternoon, Mohan’s charges will qualify for the tournament in Armenia in July. Russia are five points behind Ireland in second place after playing out a goalless draw with Azerbaijan in their opening game earlier this week. Ireland put themselves in a strong position to secure qualification with a massive 5-0 win over over Romania on Wednesday, and will finish off their campaign against the group hosts Russia next Tuesday. But if this afternoon’s result goes their way, Ireland might have their qualification wrapped up before that fixture takes place. Wright opened up the scoring for Ireland just before the break before Knight doubled their advantage with just under 30 minutes left in the game. Kamran Guliyev responded for Azerbaijan with a goal from close range after Ireland goalkeeper Brian Maher saved Turan Valizada’s penalty. That score made for a nervy finish, but Ireland skipper Jonathan Afolabi put the result beyond doubt by slotting home their third goal of the game. Russia and Romania will do battle at 2pm (Irish time). Email “Ireland U19s take another major step towards qualification for Euros with big win over Azerbaijan”. Feedback on “Ireland U19s take another major step towards qualification for Euros with big win over Azerbaijan”.